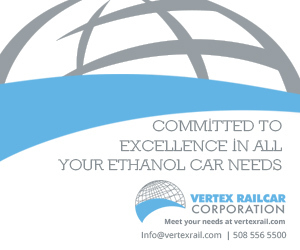 On Sept. 22, the U.S. Department of Transportation’s Bureau of Transportation Statistics released new data on the fleet composition of rail tank cars in 2013-2016 that transport flammable liquids, including ethanol. The U.S. Senate Committee on Agriculture, Nutrition and Forestry held a hearing on the nomination of Stephen Censky at deputy secretary of agriculture and Ted McKinney as under secretary of agriculture for trade and foreign agricultural affairs. Magellan Midstream Partners is now offering pre-blended E15 at many terminals across the U.S., including all Magellan terminals that service Iowa. The availability of pre-blended E15 means stations without blender pumps can now offer the fuel blend. During a U.S. Department of Agriculture trade mission to Brazil Sept. 25-29, leaders from 24 U.S. agribusinesses and trade organizations will explore opportunities to expand their agricultural exports and further develop their business relationships. The American Coalition for Ethanol congratulates Jetz Convenience Centers for the addition of new ethanol blender pumps at its station in Muskego, Wisconsin. A grand opening event was scheduled to take place Sept. 26. New Zealand’s got milk—record amounts of milk production—and the country’s dairy industry is feeding triple the amount of U.S. distillers dried grains with solubles (DDGS) year-over-year. U.S. Secretary of Energy Rick Perry recently announced that the U.S. Department of Energy has selected eight projects to negotiate for up to $15 million in total DOE funding to optimize integrated biorefineries. The Minnesota Bio-Fuels Association and KS95 FM teamed up on Sept. 20 to reward drivers who fueled up with E15 (Unleaded Plus) at Bona Bros Minnoco in Fridley. Twelve drivers who switched to E15 were rewarded during the event. Eleven students from Red Rock Central High School traveled across town on Sept. 15 to visit Highwater Ethanol to learn about renewable energy production. The tour was organized by the Minnesota Bio-Fuels Association.